SOLIDWORKS Product Data Management (PDM) solutions help you get your design data under control and substantially improve the way your teams manage and collaborate on product development. The software provides a comprehensive set of intuitive product management solutions that keep you and your team focused on designing better products, instead of searching for data. The range of PDM solutions provided by SOLIDWORKS address the typical concerns around file management, design reuse, revision management, engineering change management, BOM management, regulatory compliance, secure file vaulting, distributed collaboration and offers enterprise scalability. 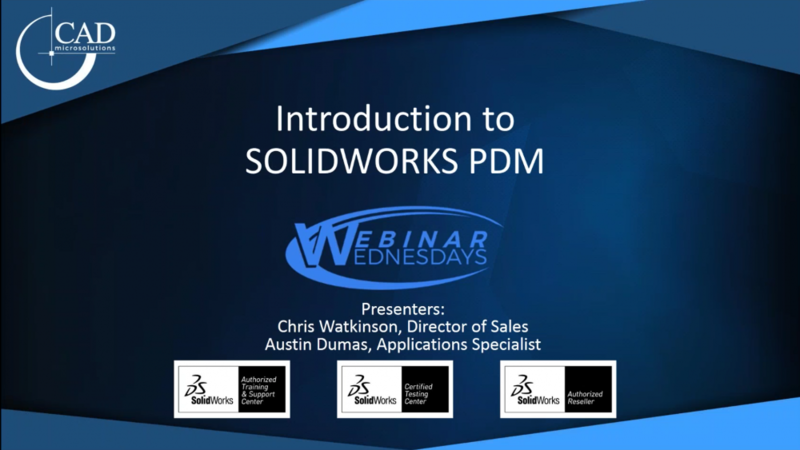 This video below provides an overview of what SOLIDWORKS PDM is, what it is capable of, and the various licensing options available to you. For a detailed matrix comparing the features and capabilities of SOLIDWORKS PDM Standard and Professional, or for a free consultation to see how implementing a PDM solution will impact your organization, write in to us at contact@cadmicro.com or give us a call at (416) 213-0533.